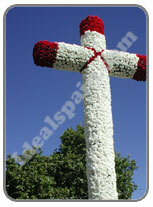 During the month of May, the people of Spain create thousands of crosses, decorated with flowers. These floral works of art are displayed in gardens, churches, patios and in the streets. These are made to celebrate the Festival de la Cruz de Mayo (The May Cross Festival). The crosses are made by the whole family and parties are held to make them. This is done to herald the arrival of Spring. The worship of the cross dates back to the 4th century AD when according to tradition, St.Helen found the cross of Christ and honoured it by building temples in Jerusalem.